Imagine sitting in the cockpit of a Boeing VC-25 or the Lockheed Martin fighter-bomber F-35 Lightning. You are operating its flight stick while responsibly maneuvering the skies to get your squad to your destination wedding. Now imagine the same feeling while sitting in your cozy gaming cockpit glued to your Ultra HD screen and operating a joystick that is better than the real deal. Do it! Aren’t you on the cusp of achieving gaming nirvana that every real gamer desires? Well, we know the feeling because we experienced it not one, not two, not even three times. But ten times this past week, all while testing to bring you the best joysticks and flight sticks. Read on to see what works best for you… whether you are a space sims fanatic or a DCS World veteran! A flight stick is a norm these days where HOTAS peripherals exist to bring you immersive gaming experience. Without it, are you even playing the game as it should be? (No we are not stealing nVIDIA’s tagline.) Check out these top 10 gaming flight sticks and build your realistic cockpit today. We talked about and imagined the incredible feeling of sitting in the cockpit of a fighter-bomber. 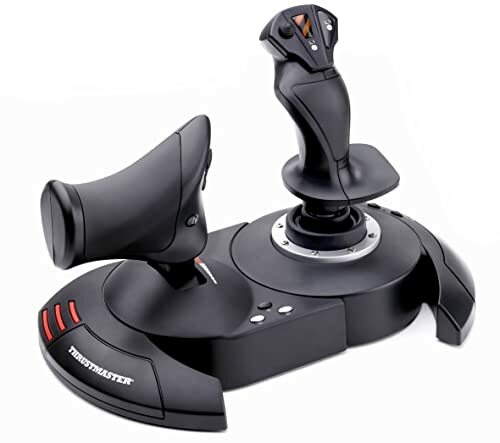 Well, this near-perfect flight stick by Thrustmaster (TM) is as good as controller technology gets. 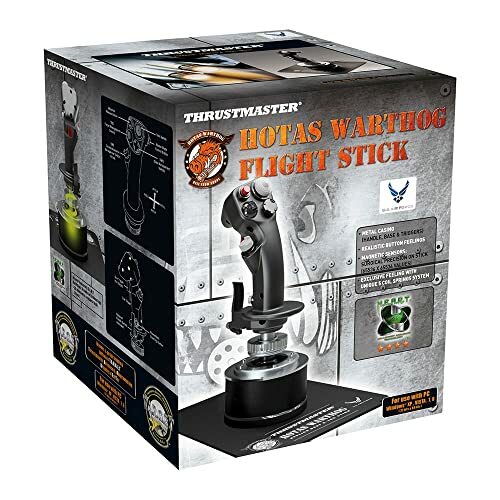 The Warthog flight stick boasts of a fully metallic casing that not only gives it weight but also makes you feel like you are operating the real flight stick. That wouldn’t exactly be incorrect because this bad boy here is inspired from the flight stick of U.S. Air Force A-10C attack aircraft by Fairchild. Even if you go overboard with your flight simulation, the Warthog is going to stay intact. With controls and switches that let you put on the fighter pilot hat, the Warthog is known for its synchronicity and precision. Just plug and play, and we promise you won’t be able to move from your gaming desk. There are a plethora of features you can toggle, but that means going through the settings in the complementary TARGET software. But who has time for that? When you are joyriding through space in Frontier’s Elite Dangerous cushioned on your Obutto rig? If you can afford it and look at flight sim as the most rewarding experience in gaming, investing and getting this little beast would be the second-best decision you make this year. (The first one would be going through this guide, y’all.) Look at it in a way that would put Logitech’s Saitek and even Thrustmaster’s own T.16000M to shame. It’s a privilege to own the Warthog flight stick. Unless you are a Yoko enthusiast and have the required resources to take that route, the Warthog should definitely be on the top of your choice list. Because this American manufacturer knows its stuff and this is the nearest you will come to handling the cockpit controls. It is realism bathed in fantasy. There is a long-running debate about Switzerland-based Saitek’s stand as the producer of the “best flight sticks for the most prolific gamers”. The recent acquisition by the Swiss overlords of computing, Logitech, has only added to the flares as gaming junkies around the world still discuss the topic in the dark passages of the online gaming community. But that does not mean that Saitek is an underdog. One of the most popular flight sticks that it even spawned a Pro version (#4 below) and a pro version of that pro version (#9 below), the X52 is known for its illuminated buttons and switches and a high degree of in-game controller customization. You can program this peripheral for each game so that when you gear to demolish your squad in Elite: Dangerous, you can be ready with your best settings. The twist rudder controls – which are more-or-less absent in the TM beast – further makes the Saitek X52 a charming addition to your gaming rig. No need for additional bells and whistles, as this one here helps you twist, throttle, and maneuver without a hiccup. The rubberized stick base removes the stiffness that is ubiquitous in such flight sticks, giving you an extra layer of comfort while handling. Even as the dying realm of space sims is back up with a reinvented energy – what with games like Flight Simulator X and Star Citizen capturing gamers’ attention – owning a HOTAS that provides versatility and flexibility is basic. 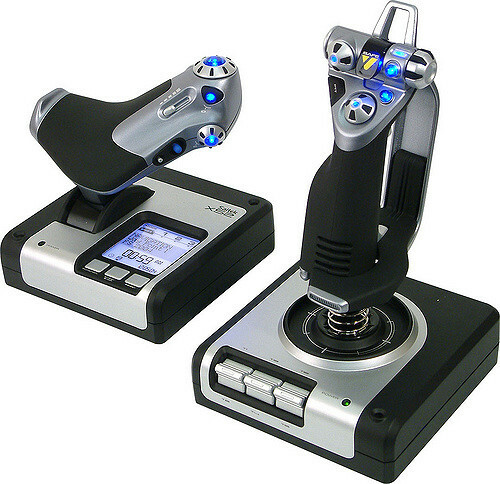 There’s no doubt about this Saitek powerhouse’s capability in that regard. 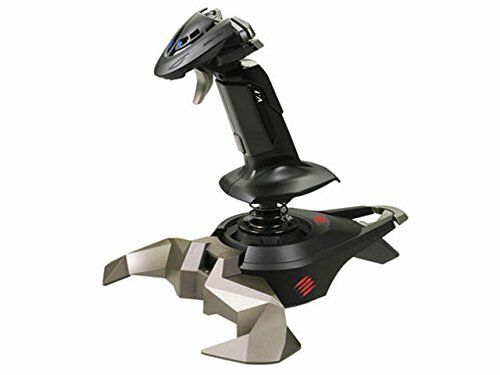 Priced modestly, the Saitek X52 is one of the best joysticks around. In saying that, we are inclining to the ‘for’ group in the debate. It has all the features that an advanced gamer would look for, and unless you are a metal aficionado or like to paint your rig red, this version would do. But, what if you are? Check out the Pro version at #4. While we have covered our top two choices of the greatest flights sticks in the market right now, there is no doubt as to what comes third, both in terms of pricing and quality. It’s Thrustmaster again, with the amped up version of the original heartbreaker T.16000. The T.16000M boasts of quite a few functions that puts the above two heavyweights to shame in certain areas. Developed keeping in mind Frontier’s Elite Dangerous, the Thrustmaster T.16000M is the epitome of style, balance, and precision. With its magnetic sensors effect for realistic space sims and a godly weight distribution mechanism, one would pause and wonder at its sheer precision at the middle of gaming. But, we hope you don’t do that because gaming is not a joke, Jacob! One of the few joysticks that supports 4 independent axes, twist rudder control, and up to 6 degrees of movement, there is no game that the T.16000M can’t help you win. Even if you are not a flight simmer junkie looking to build a tournament rig, getting this one is a no-brainer. What we also love about the T.16000M is its seamless sync with VR (we tried with Oculus Rift). Just a few setting changes in the TARGET software and you are ready to go. This is the perfect joystick for people who are looking at building a rig for games like Elite and DCS. Compared to CH Products and Saitek, the T.16000M is a steal and does not disappoint. If you have already decided to get your hands on the X52 then let us convince you a bit more as to why the Pro version is better. As noted above, this one has a dash of metal and customizable illumination. So that you can match (or contrast) your existing rig. We know how customization is important for a serious gamer (or simmer). And keeping in mind the psychology of such a person, we recommend the X52 Pro which has smooth, precise control and superior alignment. The feature to turn ON and OFF the 3D rudder twist, blanket keyboard-free approach, and a better configuration LC display (this time thanks to Logitech) make the Pro version slightly superior to any other mid-range models in this list. If budget is an issue for you then there’s no thinking twice because combine the technology of Saitek and the popularity and versatility of the X52 and you get a fantastic sim experience. The grip adjustment, which can be configured from game to game, might be a minor bell but we are definitely in love with it. Most people stick to the X52 lower version because they don’t want trade extra spends for illumination or the more realistic elements. If you are someone who likes the extra customization option, then the Pro version is the best buy. There are hardly any gamers who have not met the gatekeeper of realistic gaming: the Microsoft SideWinder, one of the most popular yet most trolled joysticks in this history of gaming. 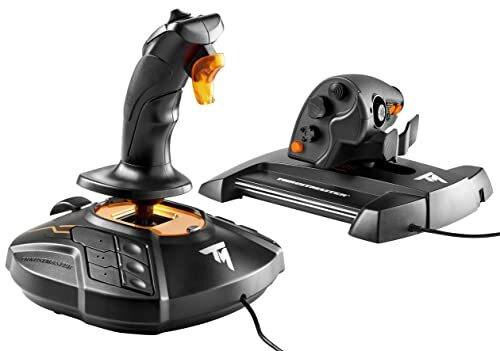 If you are someone who likes the plastic buttons and the noise they make when you punch on it in the heat of the battle, then let’s talk to its daddy: the Thrustmaster T.Flight joystick, one of the cheaper models in this list. There’s no sign of metal bearings here nor will you find enough switches if you are stepping down from any of the models we reviewed above. We are talking basic functions here, which thankfully, include z-axis rotation, a detachable throttle, and keyboard syncing. For a price that is less than 10x that of some of the heavyweights, there is definitely charm in this joystick that falls on the lower side of the price and feature spectrum. Which means that this is for the casual gamer who stays away from tournaments and who does not want to look at it as a calculated investment. But, this is Thrustmaster – known for their quality and function – which reinforces our claim about “you get what you pay for”. And this right here is a slick deal. If money is a huge factor for you and if you are a casual gamer, then we highly recommend the T.Flight. But, don’t go in with too many expectations and hope to win that war next weekend on Dangerous. A list about gaming tech is not complete if there is no mention of a Chinese brand. 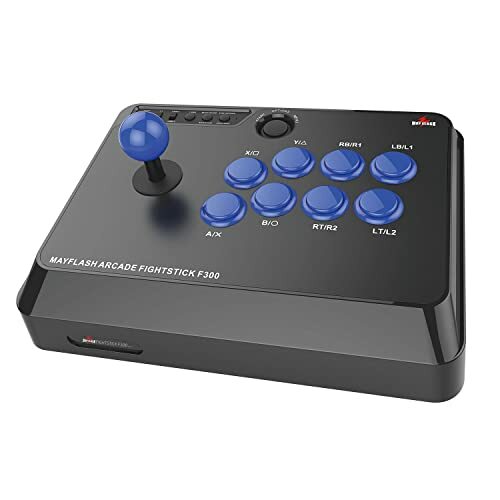 A beginner’s treasure, the Mayflash F300 is one of the best arcade joysticks for fighting games and the like. It’s not your usual HOTAS but more of a “serious toy” that packs punch through its phenomenal ability to be modded. If you like to customize the knobs and buttons of your gaming peripherals, then you are looking at a king here. The F300 is cheap, super responsive, has a swappable square restrictor plate, and can also be modded with Seimitsu or Sanwa elements much to your taste and design. There are no limits to the degree of customization that you can achieve with this little piece of Chinese technology. Games like Street Fighter and Super Smash Bros are some of our favorites when it comes to fighting. So, if you already own a HOTAS and are tired with your space simming, why not grab the Mayflash and bust some stress at the end of your busy day. It is compatible with PC, Android, and PlayStation and Xbox consoles, making it one of the most popular and widely-purchased joysticks around. 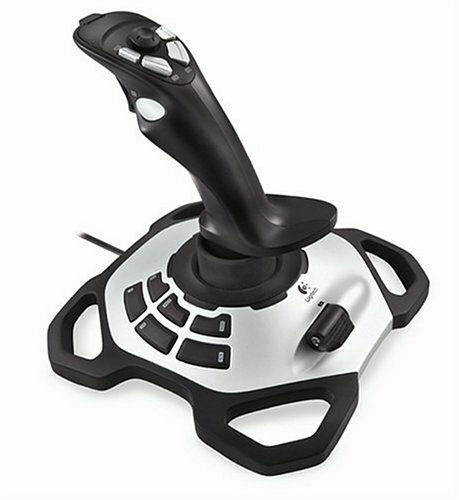 A joystick aimed at beginners, this is the only non-HOTAS model in this list. We love it because of its simplicity, mod-ability, and responsiveness. Remember the 80s when experimenting with your electronics was a hobby. This one will bring back that hobby in you. When you are creating such a list and ranking the best joysticks and flight sticks, there’s always great things to come even after the top 5. And one such fabulous piece of gaming tech is Logitech’s Extreme 3D Pro Joystick, probably their most popular and non-trolled stick. (Note that Logitech markets this under its own brand name and not Saitek, which it acquired from American video gaming tool brand Mad Catz in 2016.) Check out #8 if you are a ‘Catz fan. Don’t go by the childish (and somewhat cheap) looks of Extreme 3D Pro because this one has a wider and heavier base than most of its competitors. We played for 3 hours on stretch (mostly dogfighting or trying to dogfight in Star Citizen’s Arena Commander) and never did once the stick tip from our desk. Brownie points for the build and the black-and-grey color combination. We also had great fun using the rapid-fire trigger in Gaijin’s WarThunder, which has a default setting for the Extreme 3D Pro. While it takes more force to push, which can be both a good and a bad thing, we found that it causes fatigue, especially in the middle of gameplay. The throttle controls is another area where the Logitech stick suffers a blow, but only when you compare it with TM’s T.Flight or the Warthog. If dogfighting is your main game and Star Citizen and WarThunder the only games that you play, then you should not even check out the remaining three models. This is a stick trusted by a legion of gamers around the globe. It’s cheap, it’s capable, it’s fantastic! All the Mad Catz (MC) fans in the house can finally heave a sigh of relief. Coming in at #8 is the flight stick that MC made when Saitek was still around. Recommended for games like Wing Commander and Battlefield (BF3 and 1942, primarily), this one is a real hero at a price that makes us go weak in the knees. 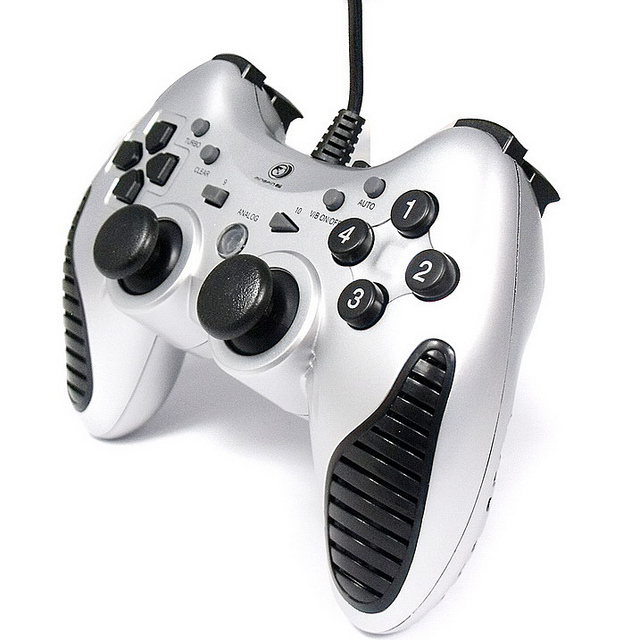 The one and only flight stick in this list that is ambidextrous – meaning it is suitable for both right-handed and left-handed folks – making it the best choice for left-handed gamers. Even the Warthog or the X52 does not provide that comfort when we are talking about alignment change. And what more do you want to know about a flight stick if it can manage to run through the horrible settings of a game like Battlefield 3?! The Mad Catz V.1 grips well, is seamless in both push and throttle, and has a good finish – all of which makes it a great addition to your gaming rig. Don’t be bothered by the customer support because you won’t need it. 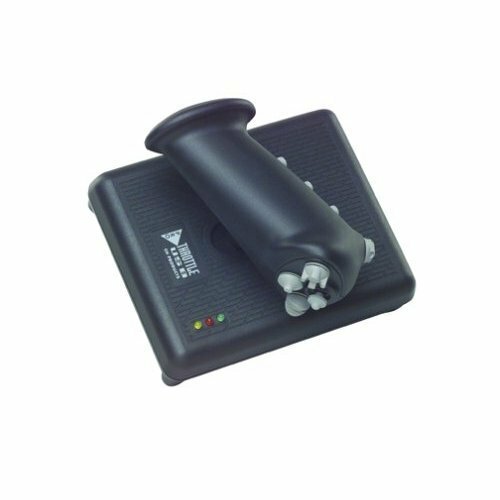 Apart from the use of a spring to hold the stick tension, we do not have any gripe with this smooth, responsive, and cost-effective joystick. This joystick (aka Saitek Cyborg V.1) has some kinks that elevate its appeal among the heavyweight that we have covered above. If you are looking for an affordable HOTAS that does the job and is effective in your dogfighting bouts, then look no further. Metaphors aside, the chief differences between #4 and this are the plastic quality and finishing, an updated LCD system, and added settings for VR. So, if you are into the VR game (HTC Vive, if we may recommend) and are a die-hard space simmer, this is a great choice. 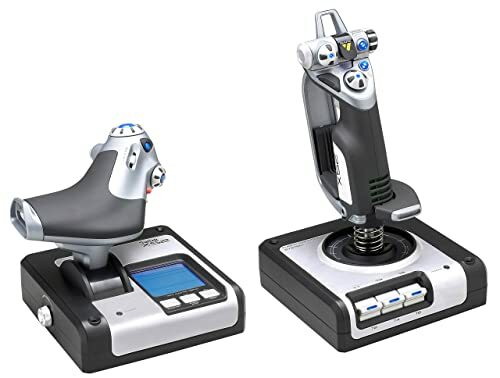 Even though the problem of the erroneous software persists (as with every Saitek HOTAS), this is one of the better flight sticks in the market right now. If you abhor flight sticks that look like toys and want a realistic HOTAS for all your space sims, and have an extended budget, we highly recommend the X52 Pro. Don’t want to spend a fortune but still want to live the YOLO life and get into flight and space simulation games? We have got you covered. In joystick parlance, this model is an infant but with tons of experience. A quick look will give you a good idea about its capability and function, and we mean it in a positive way. Homegrown brand with roots from Europe, CH Products is the real underdog here. An old brand with over 30 years of presence in the gaming and tech realms, this Pro flight stick is one of its bestselling models. With 24 buttons that will make you go gaga and use only half a dozen out of them, z-axis throttle function, and a mini stick for extended rudder/yaw control, this one has all the features of an average flight stick. But the things that make it above average are: compatibility with all versions of Windows and macOS, manufactured in the US of A, built with high-quality plastic and renowned for its longevity, and no center (or 50%) dent. While we know that that last feature is subjective, we can’t stop raving about this little piece of cost-effective gaming peripheral that is perfect for both simmers and casual fantasy gamers. Additionally, CH Products is known for their fantastic customer support (not that you will need it) and its proprietary software that would bring the DIYer in you. There is a lot going on in this CH model – the 7-foot USB cord counting – all of which makes it a casual gamer’s sweetheart. No need to worry about squeaks or denting because CH has it covered for you in arguably their best product to date. These are the top ten best joysticks and flight sticks that you can consider to enhance your gaming experience. Whether it is space simulation or arcade fighting, these are worth your money. 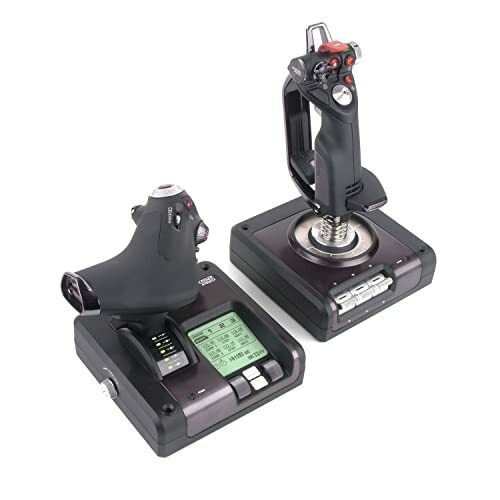 But, if you are new to the world of HOTAS and joysticks, why not get the basics right first and then select your option? Here is a brief guide to help you make a wise purchase because buying a joystick is not like downloading a free game from Steam or GOG. It’s a long-term investment and requires a few sacrifices (we know because we spent sleepless nights testing these for you). What is the Relevance of Joysticks/Flight Sticks? What All Should I Look for? These are the essentials, but you can go through the detailed reviews to make your final choice. HTC Vive or Oculus Rift – Because no one likes to be left out in this VR age. YOLO? These are the best joysticks and flight sticks that money can buy. The important thing to note is that these models have stood the test of time, and continue to be the best in what they offer and how. 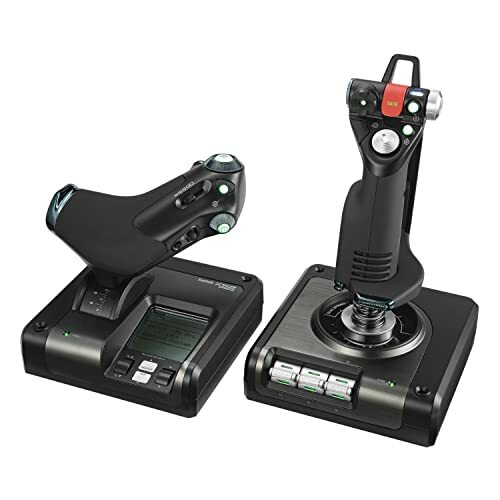 While Thrustmaster wins the competition hands down with its Warthog HOTAS being the most desired flight stick right now, we also want to cut some slack to Logitech’s Saitek. Their X52 is in the similar range, competing also with the T.16000M and the T.Flight HOTAS. Underdogs Mayflash and CH Products are also in the game and are more loved by gamers who are on a budget. In an ideal world, the Thrustmaster HOTAS Warthog should be in every gamer’s desk, and if you can create such a world (at least in your house) then we have succeeded in what we set out to achieve. It’s a great time to be a gamer, isn’t it?